Hi, Josette here with another Holiday Card. I love this little Kitty Stamp. Another team member did an adorable card with the same stamp set and I thought you might like some more inspiration for Kitty Sweets. This card and image were all watercolored. The trees were masked off and painted, then embellished free hand, no stamps available, but you can pop over to My Blog and see how I created the trees and background. This is so cute. Love the scene. It's so cute, I love the way the cat pops from the awesome background. 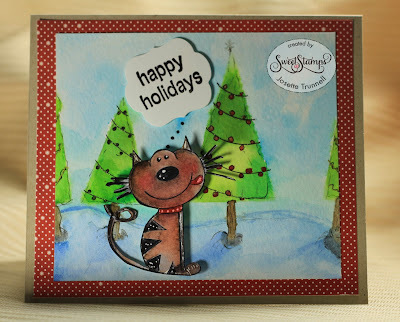 Thank you all for visiting and taking time to comment on this adorable Kitty Card.